Ahwatukee Condo Search: According to Wikipedia, “Ahwatukee is a triangular shaped sub-urban village of the City of Phoenix, Arizona bordered on the north by South Mountain Park and Guadalupe Road, on the east by Interstate 10 and the cities of Chandler, Guadalupe, and Tempe, and on the south and west by the Gila River Indian Community. It is the southernmost of the city’s 15 urban villages. As of 2010, the 35.8 square-mile (92.7 km²) neighborhood has a population of 77,249. 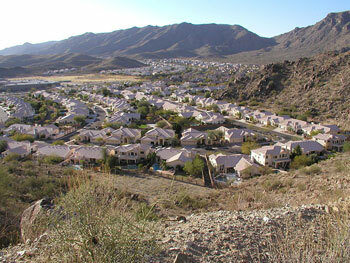 Ahwatukee is quite unique and would be considered an affluent area demographically. Many people are confused that Ahwatukee is actually a city in its own rite, however, it is actually a Phoenix neighborhood. Measuring a full 36 square miles, Ahwatukee was wisely developed to South Mountain, one of the last mountains to be developed in the area. Ahwatukee is conveniently located adjacent to South Mountain Park Preserve, which provides Ahwatukee Condo residents the ability to conveniently enjoy over 25 square miles of pristine desert and mountains with a plethora of hiking trails and views you typically only dream of. The Gila River Indian Community is just to the South (with a great Casino, if you like to gamble) and Interstate 10 is nearby for easy access to downtown Phoenix to the north (Phoenix Sky Harbor International Airport is about 20 minutes) and Tempe and Chandler to the East. Plenty of shopping (from malls to large shopping centers) and dining options (from fast food to fine dining) can be found nearby.